ZHENGZHOU, China, Mar 27, 2018 (SEND2PRESS NEWSWIRE) -- Zhengzhou Uniwin Machinery and Equipment Co., Ltd, makers of Uniwin Nail Making Machines, announced that two months ago the company delivered one whole production line of coil nails making to Izmit Port, Turkey. - Requirement: Ring type nails, nailhead cross type. Our model z94-2c and z94-3c wire nail making machine are suitable, z94-2c can make 30,35,40,45,50mm nails, z94-3c can make 55,60,65,70mm nails. On January 2018, our customer received the machines and installed the machines in their factory. After the workers saw the manual and detailed training video, they successfully started the machine; now the machine is running very well. They also send us back some pictures and video. Quality nails make coil nails hot selling, more and more orders are coming, now they are planning to add one more coil nail making machine line to expand the capacity, we will, as always, make the best quality equipment and offer our expert service to our customers. With the improvement of people's living standard, people's requirement has a great improvement in material aspects. The frequency of furniture replacement is also constantly increasing. Traditional common wire nails already cannot meet people's demand. however, coil nails can improve the production efficiency, it is widely used in decoration, wood packaging industry, etc. such as soft and hardwood, bamboo devices, ordinary plastics, sand walls, repair furniture, packaging wooden boxes, wood pallet and so on. 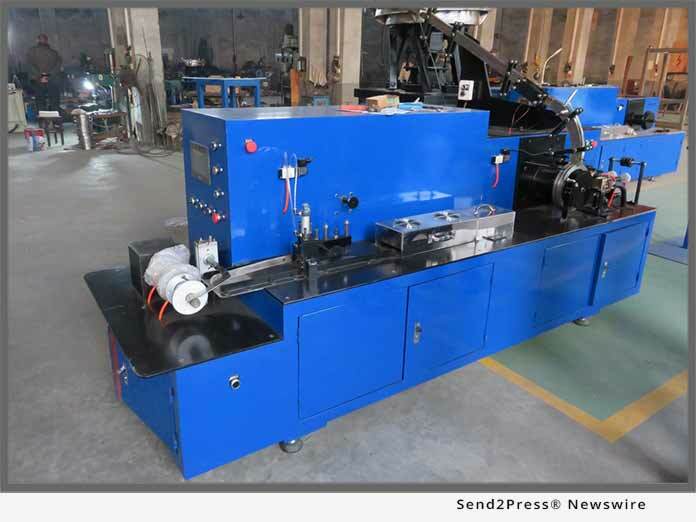 wire nails making - nails polishing - nails threading - weld into coils by the coil nail making machine - packaging. The process is to make the wire nails first (by using wire nail making machine), secondly, polish the nails and remove the thorn and dust (by using the polish machine), and then thread the wire nails to make different thread type nails (by using the thread rolling machine), lastly, weld the nails in coils (using the coil nails collator), and then you can get the finished coil nails used in nail gun. For our high-speed coil nail making machine model JD-100, it is fully automatic high-frequency high-speed welding equipment for nails. Put the nails into feeding hopper, it will transport the nails to the vibration plate automatically. These nails will be arranged in order by vibration plate, and then go through blanking track into nail wheel, then nails welded line together into a roll. The equipment adopts imported programmable controller and touch-sensitive screen display, it can automatically detect missing materials, missing nails, counting, cutting materials in the system, which can make the whole system is accurate, reliable and stable in quality.